My latest book was released, and as anyone who has been through the process knows, it takes forever. However, this one took extra long, so despite the optimistic title: something new seems to be a wee bit stale by now. Nevertheless, I'm glad to have it out. A few years ago, I organized a workshop for canon lawyers on these topics. This book is a further development of those materials. 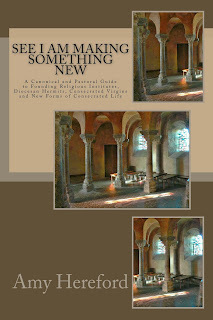 See I Am Making Something New by Sister Amy Hereford, CSJ is a pastoral - canonical guidebook that explores the various ways in which the Life of the Spirit is stirring anew in the Church today in new religious institutes and societies, in diocesan hermits and consecrated virgins, in the new forms of consecrated life, and in the ecclesial movements that bring life and vitality to the Church today, and in fact, may also give rise to new institutes. The book is a guide for those discerning their vocation and their spiritual directors and a pastoral manual diocesan personnel. New Community (Canon 579): We may recognize five stages in the foundation of an institute. A single institute may spend several months, years or decades in each of the stages. The history of religious life testifies that the foundation of an institute is the work of a lifetime, and its progress is not counted in terms of members, or buildings but in terms of the treasures laid up in heaven. Hermits (Canon 603) flourished in the early Christian centuries, even before religious communities organized as we know them today. With the revision of the Code of Canon Law in 1983, this form of life came back into the practice of the church as a canonically approved vocation. The vocation is characterized by a "stricter separation from the world," and by silence and solitude. Canon 603 adds that the hermit professes the traditional three vows of poverty, celibate chastity and obedience. Consecrated Virgins (Canon 604) - Many early Christian writers extol the beauty and power of the Christian virgin in a spousal relationship with Christ, just as the church is spouse of Christ. This allegorical theology held great power and meaning from the early Christian centuries. By the middle ages, the rite of consecration of virgins had been nearly completely incorporated into cloistered monastic life of nuns. In the early twentieth century, individuals and groups began to seek to restore this ancient form of consecration. The revised rite was promulgated in 1970, and it is best source of understanding the vocation of the consecrated virgin. New Forms (Canon 605) - In recent decades, a new instinct for communion in consecrated life seeks to bring various groups together into a single religious institute, men and women, cleric and lay, married and single. Canon 605 provides the canonical opening for new forms of consecrated life, and most of these new forms manifest this instinct for inclusion. Some have sought formal approval as new institutes or new forms of consecrated life. God moves among us in holy creativity. This book explores they ways in which God is "making something new," in new religious institutes,in newly re-introduced individual forms of consecrated life, the diocesan hermit and the consecrated virgin, and in the new-forms of consecrated life. May we each have the wisdom and courage to live our vocation, and may we love and support each another as we follow our unique vocation, our unique path in the heart of God. Available on Amazon and Kindle, you can check it out here. There are times when we in religious life question where we are, who we are becoming, whether it’s all worth it, whether it is still life-giving. I suspect the same happens in other forms of life-commitment. Sometimes the answer to these questions is gift and blessing, and a resounding yes to God, to community and to mission. At other times, we struggle to find the strength and courage, we struggle on amid questions and challenges, we experience our own weakness and the weakness of others with whom we share this life. 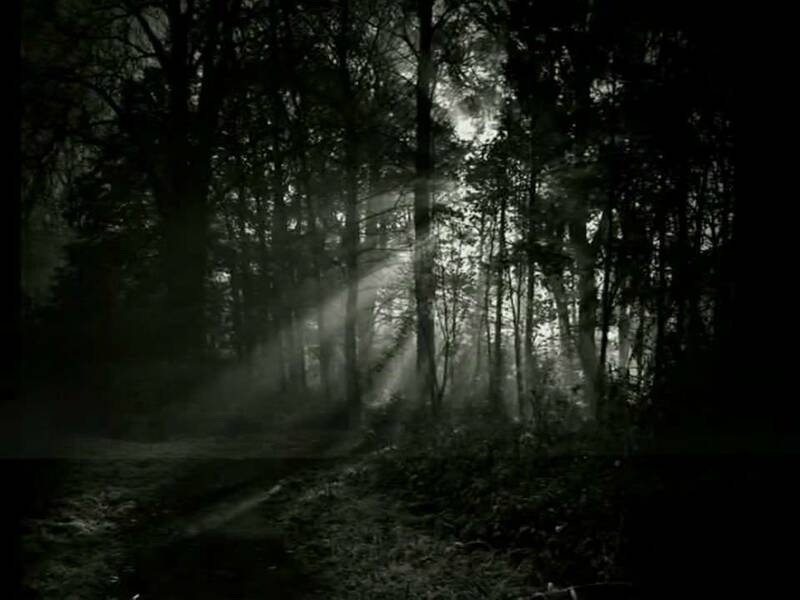 In these dark moments, our sisters can walk with us, our sisters can sit with us in our dark places, peering out for glimmers of solace and hope. They can pray for us and they can support us. At times like these, we come to realize that while we are radically in community, we are also radically alone. Our presence in community is premised on our personal commitment to our God and the path that God has carved into the core of our being. As we come into community we love and support one another in this journey of the heart, the journey of our vocation. There is a give and take between personal journey and community journey. As we move through life, these two can enrich one another, they can also challenge one another. In nature, plants grow and are nourished by their interactions with the climate and the ecosystem. Some species will thrive, despite occasional challenges and stresses. Others will not be able to make it in that particular ecosystem, in that micro-climate. For me, this is an image of vocation. God calls us by creating us in Love to be persons who thrive in the vocation we call religious life. The climate of the life, its vows, its ministry, its spirituality all conspire for our growth. The ecosystem, our sisters, our community, those with whom and for whom we serve, support and challenge us to become the best of God's dream for us. As we grow in our vocation, our roots sink deeper and deeper into the soil of God, community and mission. We grow more resilient to face the inevitable challenges that come. The journey of vocation discernment and of initial formation is a time to find that place God has called us and to learn to "bloom where we are planted." Once we are permanently professed, we have a certain groundedness, yet life continues to unfold and challenge us. May we be a blessing to one another on this journey. I've collaborated on a book that explores various ways of living sustainably. 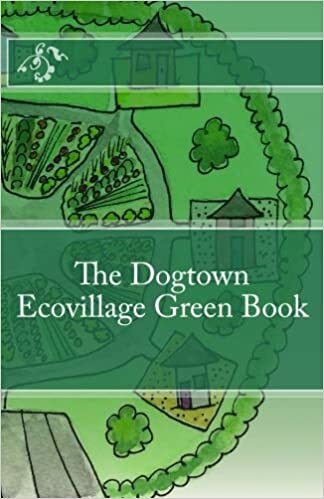 We're calling it the Dogtown Ecovillage Green Book.